Feiwel & Friends, 9781250117366, 32pp. Think you can win a staring contest against an elephant? What about a gorilla, a cheetah, a fox, or an alligator? What about all them—AND a bunch of their other animal friends—at the same time? You're about to find out! Whatever you do DON'T BLINK! 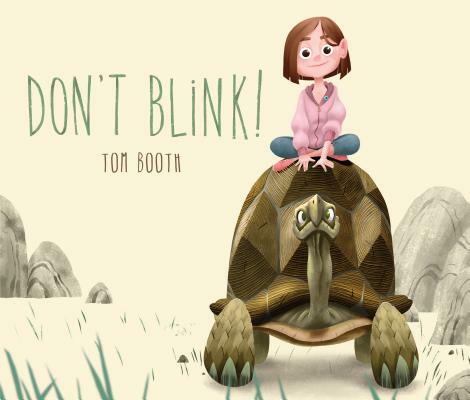 Tom Booth is an author, illustrator, and character designer who has worked in both animation and publishing at Macmillan, Scholastic, Simon & Schuster, Workman Publishing, and Nicktoons. Tom made his earliest marks—sometimes on his parents' antique kitchen table—growing up in Pennsylvania. Now living in Brooklyn, New York, Tom is currently at work on several picture books on a table all his own. His books include Derek Jeter Presents Night at the Stadium and Don't Blink!.